MAC (Make-up Art Cosmetics) often written as M·A·C is an American make-up company founded in 1984 in Toronto. More recently, it was bought out by the Estee Lauder group of companies. M·A·C is known for its stylish black boxes. Fans of its cosmetics swear by the foundations, eye shadows and lip-glosses. M·A·C has a devoted following worldwide among stylish women and increasingly, men. Where can I check my MAC giftcard balance? You can enter your gift card details on the MAC giftcard balance checker to see your latest balance. Where can I spend my MAC gift card? OK, this is where is gets complicated. The card is welcome at MAC “Boutique” stores. Basically, these are stores owned by MAC. In the UK, there are 7 of these dotted around London. You can buy MAC cosmetics in some department stores, such as those in House of Fraser, but you can’t use the giftcard here. MAC have a few stores in UK airports, particularly Heathrow, but for some reason you can’t use the cards here. MAC have a mail order operation, but you can’t use the cards here. MAC have an online store at http://www.maccosmetics.co.uk – you can use your MAC cosmetics gift card here. Where can I buy a MAC cosmetics gift card? Some department stores, such as House of Fraser, offer MAC cosmetics branded gift cards – confusingly though, these are really just House of Fraser gift cards – so you can use them there, but nowhere else. 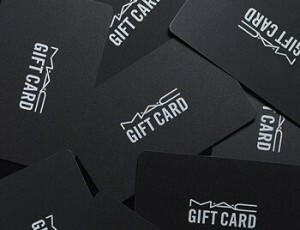 You can buy “MAC” gift cards, which can be redeemed at their stores and on their online shopping site from any of the MAC Boutique stores in the UK. You can buy MAC gift cards online from their website at https://www.voucherexpress.net/mac – they also have an electronic version of the gift card for instant delivery at https://www.voucherexpress.net/mac/byemail Interestingly, they don’t charge for postage. Does a MAC cosmetics gift card expire? No. Their website states that their gift card has “No fixed expiry date” so you can take your time spending it!